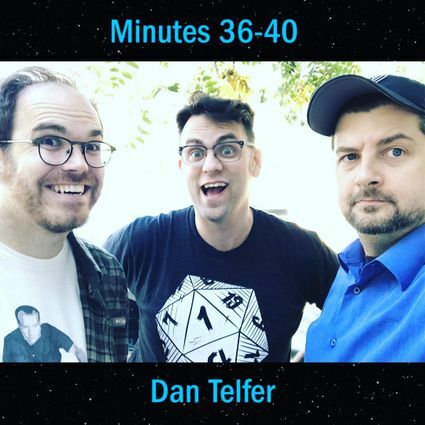 Dan Telfer is a lugubrious sprite who most likely owns a thesaurus. He who wrote and performed comedy in Chicago for 15 years before moving to Los Angeles. Dan has been writing and performing comedy since 1996 and has toured as an opener for Maria Bamford, Brian Posehn and Patton Oswalt. You may have noticed his debut CD EP "Fossil Record" as a split release with Greg Proops and Paul F. Tompkins, or his debut full length CD "Tendrils of Ruin", both on AST Records. In 2011, he performed at the Chicago Just For Laughs Festival’s Best of the Fest show, the Montreal Just For Laughs Festival’s Talk of the Fest show, and the coveted New Faces of Comedy showcase of both festivals. His writing has appeared inPaste Magazine, The Onion, and The A.V. Club. But he is perhaps known best for his stand-up chunk “The Best Dinosaur,” which became a runaway viral video hit and earned him an internet following. He's also on that one podcast where they talk about Dungeons & Dragons and stuff. He now the senior editor of Mad Magazine.